We now come to lucky chapter thirteen of Rage of the Old Gods, the first book of my epic science fantasy trilogy the World Spectrum. In the coming weeks, I will be posting the entire book for free on this blog. If you’re just joining us, you can get caught up with the previous chapters now. Part four begins with the survivors of the human race at their lowest. They are barely holding off the constant assaults of the Old Gods, and all hope seems lost. But a chance discovery in the primordial forest beyond the Gormorra Range could change everything. She opened her eyes and blinked. It took a moment to remember where she was and who was knocking at her door. She sat up and groaned, rubbing her eyes. Golden light poured in through the shaded window to fill her tiny room within the Clan hall – she had been offered the large room that had once belonged to Brodar and his wife, but she had given it to a family of Karkarans. She forced herself out of the sheets, put on her tattered tunic and stained pants, and opened the blinds, telling Lahune to wait a moment. She blinked again as the light of day struck her eyes. The sun had risen high in the sky, and peopled scurried about their business in the camp. She’d slept in. She sighed. “Come in,” she said, questing about for her comb. The door opened, and Lahune stepped in, his dark robes rustling. “Good morning,” he said. “Is it still morning?” She looked through her clothes chest, then, finding nothing, began to rifle through drawers and hidden compartments in the walls and floor in the search for her comb. Leha closed her eyes and tried to remember where she had last seen the comb. Before the war, Drogin had often commented on the lack of order in her home. Sometimes, he’d helped her to reorganize things if they became too chaotic. The thought made her frown. Lahune sat down on a stool, unfolded a small table from its housing in the wall, and set down his sack of writing supplies. “Stay up late?” he asked, laying out the quills and ink he had constructed from whatever came to hand. He chuckled at her joke, but she saw concern in his eyes. He pulled a small flask from his pouch and tossed it to her. She pulled her claws from her hair and caught it. “Thanks.” She took a long draught of the thick fluid. The sweetness helped to chase away her fatigue. “Right.” She gulped her ulu. Over the past month, Leha had taken to chronicling the events of the past year. She wanted to preserve a record of the war for future generations – assuming there were any – and it helped to pass the time between battles. Her handwriting had never been her strongest asset, so Lahune had volunteered to work as her scribe. One of the things his order had done before the war had been copying and preserving books and manuscripts. They believed in the importance of safeguarding human history and culture. Lahune would write down her dictations in Urannan, and then, as materials permitted, he would make copies in Eastenholder, Piran, and Tor. Paper was hard to come by, so they used whatever came to hand: skins, the backs of maps, the inside covers of books. On occasion, they had even used thin blocks of wood. It made for a motley collection. They numbered the passages to save confusion. Leha finished the ulu and rubbed her right eye with her knuckles. “Could we skip this today? I’m not feeling my best.” Technically, Lahune could work on his own – Benefactor had allowed him to live her memories of this time – but they had both agreed that the record should be provided by someone who had lived it, someone in a position of authority. He gave her a brief smile. “Of course.” He started to repack his things. She stood. “Close the door on the way out,” she said, stepping into the hallway. She exited the hall and stepped onto the soft, moist grass of the meadow where they had made their camp. She strode through the rows of tents and crude dwellings, hearing the conversations of her people as she passed by. She considered seeking out some breakfast, but the reindeer jerky and old cheese that had become their staple held little appeal. The crystalline sky held no evidence of the rain of the past weeks, and the late spring air was warm, but the beauty of the day seemed empty and fragile, as if it was but a thin façade draped over the world. Some of those she passed greeted her or made way so that she could pass, but their eyes held none of the deference they had shown before. They no longer viewed her as their salvation, she knew. Beneath the surface, past whatever expressions they chose to wear, she sensed that her people had lost hope. They moved with slumped shoulders and listless gaits; they gazed upon the world with hollow eyes. They seemed to have been broken on some deep level. It didn’t matter whom she looked upon – Tors, Karkarans, Lost Ones, ice creatures – she saw the same things. She passed a few open spaces while on her walk, and in some she saw groups of young children play and laugh, but even their joy seemed brittle and weak. The Automatons’ assaults on Sy’om and Tyzu had brought humanity to the brink of defeat. After the machines had finished ravaging the ice creature and Lost One settlements – and the wizards of each had learned to send back the weapons when they arrived – they had begun launching their attacks at random in the hopes of ruining food and water sources and causing environmental disasters. Wide sections of both worlds had been reduced to ash. The mere thought of the burning fields that had once been Tyzu’s jungles was enough to bring tears to Leha’s eyes. The shipments of food and supplies from Tyzu had grown few and far between, and some of the Lost Ones and ice creatures had been forced to return home to aid with the recovery. The attacks no longer came frequently, though they hadn’t stopped completely. Tyzu had begun to recover, but even there, it would likely take years. She reached the edge of the meadow – and the camp – and started into the forest of tall evergreens that stretched for unknown miles in every direction. Here, the sunlight dimmed, and the air smelled of pine and spruce. The shed needles of countless trees and countless years provided a carpet for her feet. This was uncharted territory. Leha knew of no one in all of history who had made the journey to the eastern side of the Gormorra Range. The crossing had been arduous, and they had lost many people to the elements along the way. They had crossed some of the roughest terrain in the world during some of the worst weather in the world, and they had barely survived. But as hard as the journey had been for them, it would be harder for the Automatons. The machines could not adapt to harsh conditions as easily as humans. This was as safe a place as they could hope to find. A small group, commanded by Brodar, had stayed in the mountains to ward against any assaults the Automatons might send. So far, they had done nothing but watch and wait. Most of the fighting took place far away, at what had once been the northern edge of Tor Som. The chieftains of the Althing, convinced by Brodar’s reports, had agreed to join the war, and the forces of the Northern Clans, together with what remained of the armies of the other nations, held the line against the seemingly endless Automaton offensives. For now, at least. Leha had considered stationing herself on the front, but some had said that it would put her at too much risk, and she had not argued. She went there by jumping points to lend her aid whenever the machines launched a major attack, but she returned as soon the fighting ended. These days, more and more people spoke of the need for her to create others like her, others who could channel the powers of the other worlds and modify their bodies at will. But she would not. She had decided. As long as she lived, she would never allow the creation of another person like her. It was too much power for one person to wield. As she walked between the evergreens, she tried to enjoy the beauty of the day, but her mind inevitably turned to darker things. She thought of the night before, when she had visited Benefactor. For the last three months, she had struggled to help him overcome the grief he felt at the destruction of his home colony. She’d had little success. She didn’t know what to do. She had lost much in the past year, but none of it could compare to what he had suffered. Nearly everyone he had ever cared about had been killed, and he had seen their deaths through their own eyes. She couldn’t – didn’t want to – imagine what that felt like. She tried to be there for him, tried to get his mind on other things. She could only hope that he would one day recover. She shook her head to clear it. You’re here to relax, she told herself. She heard a soft babbling of water, and she came to the banks of the River Sheen, a dark ribbon flowing through the trees. She sat down on a damp rock at the shore and placed one of her bare feet in the current. The water was frigid – its source lay deep in the mountains – but to her calloused feet, it felt pleasantly cool. She stayed there, taking what pleasure she could from the sun and nature. She enhanced her eyes and swept her gaze around the landscape. To the west, she saw the towering peaks of the Gormorra Mountains. With her enhanced vision, she could make out the details of all the peaks and valleys. She saw where the river emerged from the peaks and spilled into the forest. Somewhere in those mountains, groups of Eastenholders still survived, she knew. Her people had been joined by some of the survivors of the Battle of Heart during their journey across the range, but others remained among the peaks. She thought of Abra, the librarian from Heart. After the battle, she had searched the ruins of the library and asked all she met if they had seen him, but she had never learned his fate. She knew what it had likely been, but she had always hoped the old man had made it into the mountains and survived, somehow. To the east, a round mount, little more than a tall hill, rose over the woods. It stood alone in the forest, its flanks dark with trees. Its name was Yeldar. She noticed something. On its side, her enhanced eyes saw a small patch barren of trees, and within it, a patch of darkness like a cave or a doorway. She leaned forward. A sensible voice in her mind told her to go back to the camp and return with allies. She nearly did. But she didn’t think she would encounter anything dangerous in this place. She ignored the voice. Summoning Tyzu’s power, she came to her feet, screwed up her legs, and leapt across the river, landing neatly on the opposite bank. Hardly missing a beat, she took off into the forest, ducking under branches and swerving around trunks. She glided over the ground, seeming to barely touch it, darting through trees still damp from recent rains. She reached the foot of Yeldar and ascended the slopes. Her claws dug into the mulch for purchase on the steep incline. She grabbed onto the trees as she passed and used them to push off and gain extra thrust. She arrived at the place she had seen from the river, a patch clear of trees on the mountain’s western flank. Only grass and a few wildflowers grew. A few steps of white stone led up to a doorway leading into a dark space within the mountain. The steps didn’t appear to be newly made, but they showed no sign of weathering or age. She let Tyzu’s energy fade, and she stepped forward, moving onto the steps and towards the door. The sensible voice spoke again, but she squashed it down. She entered the doorway. The passage was cool and dark, and her breathing echoed oddly. It went straight for a few paces, and then it descended into the darkness. She adapted her eyes to be better able to see. She wished for one of the Clans’ magical lanterns. The passage was stone at first, but then it shifted to something smoother and less cold. It felt like polished wood. The stairs ended. She could see that she was in a chamber of some kind, but little light reached this depth, and she had trouble judging its size or shape. From the feel of it, the floor seemed to be constructed of interlocking pieces of wood. She also encountered parts that felt to be made of metal. An idea occurred to her, and she reached into her pocket to retrieve the small flint and metal device she used to light her cooking fires. She summoned Sy’om’s power and worked the device’s switch, producing a few tiny sparks. With the lower energy, the sparks hung in the air for a few extra moments, and their feeble light proved enough for her modified eyes. She could see. The chamber was not much larger than her shop in Three Gates had been. It was constructed almost entirely of dark, polished wood, occasionally laced with bands of dark metal. Here and there, accents of gold added color. The architecture was unlike anything she had ever seen. Its rounded edges and flowing style spoke of the natural world, but its interlocking wood and metal spoke of machinery and industry. Six columns, slanted outward, supported the arched ceiling. 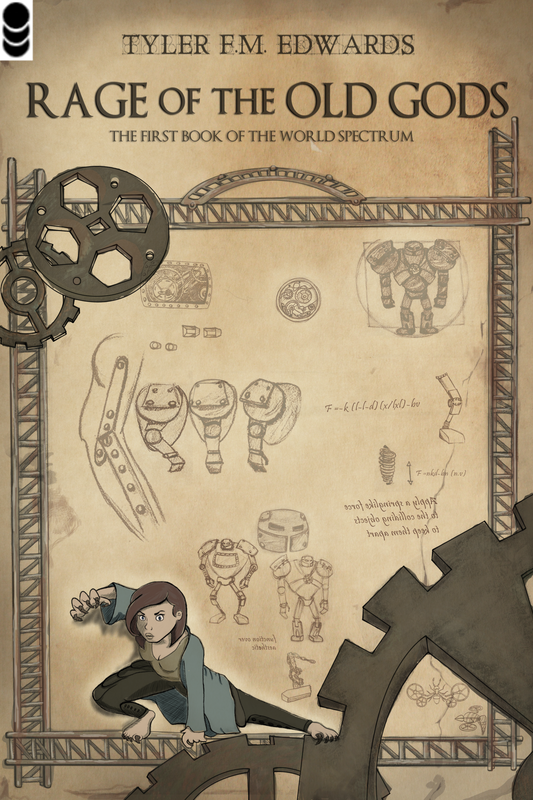 At the far end, she saw what appeared to be a large metal globe set within a jungle of gears and machinery. It all gleamed like something newly made, but the place exuded age. Leha drank it in. The light went out and left her in the darkness. For a moment, she wondered if Old Gods had built this place. But she knew they hadn’t. They had never made anything so elegant, so beautiful. Reluctantly, she turned away. The others needed to see this place. It needed to be studied. She emerged into the light, summoned Tyzu’s power, and sped for the camp. All around him, the camp seemed dead. As Yarnig trudged through the muddy paths between the tents, his eyes passed over blank faces and empty stares, the expressions of those who had lost everything. The people moved lethargically, seeming more mechanical than the Automatons who had destroyed their lives. A few of the Tors offered him perfunctory greetings or small bows, but most of his people did not acknowledge his passing – they knew he was not the true leader of his people. Yarnig could well understand the hopelessness that pervaded the encampment. He, too, had lost nearly everything that mattered to him: his home, his hunting trips in the country, even his artwork. It had been weeks since he had been able to draw or paint anything. With the war on, no one had the time or the resources to waste on making things like paper or canvas. A simple lack of supplies had put an end to his artwork. His sketchbook had lasted him for a while; during their flight from the cities, he had feverishly produced sketches of his country home and the remains of Retgard and Kerhem, trying to preserve what he could of them. Afterward, his drawings had documented their journey through the mountains and their arrival in this wilderness. But then he had run out of pages. For a time, he’d had nothing to occupy his days. Erik was often busy performing magical tasks, so he rarely had time to spend with Yarnig, and Eranna did all the real work of ruling the Tors – what remained of them. But now, he had something to give purpose to his days. He strode past the last tents and into a small, unoccupied pocket of the meadow, the warm sunlight dusting his hair with gold, the dewy grass moistening his beaten leather boots. Ahead, Natoma stood, waiting for him. The sun shone off her hair to give her an ethereal quality. She saw him and waved. He smiled and rested one hand on his sword pommel, waving back at her. A warm breeze ruffled his curly hair, and he breathed deeply, enjoying the scents of the nearby forest. Two weeks ago, Yarnig had been wandering the camp in an attempt to kill time, and he had encountered Natoma. They had fallen into conversation, and she had offered to teach him swordsmanship. He wasn’t sure why she had done it. Perhaps she had taken pity on him. Perhaps she had been bored. After Marlhem, the people had been less willing to put their leaders on the front lines – not that he was a leader, Yarnig thought – and they both had plenty of idle time. Whatever her reasons, he felt grateful that she had made the offer. He had started the lessons as merely a means of distracting himself, but he had begun to genuinely enjoy them. His fingers longed to wrap themselves around a pen or a pencil again, but if they could not do that, they would settle for a sword. He reached Natoma, and they greeted each other. Yarnig nodded, smiling ruefully. Their first attempt at sparring had only led to her besting him repeatedly; afterward, she had apologizing for pushing him too quickly. Natoma began to stretch, moving with catlike grace. Yarnig followed suit, though he could not be so elegant. Her first lesson to him had been the importance of stretching before practice to loosen his muscles. When they finished their stretches, they drew their swords. Yarnig had been given a long, single-edged sword of Urannan design. It was an unusual weapon for a Tor, but Natoma was his teacher, and it was what she knew. They started into a series of Urannan sword postures intended to teach him the proper ways to cut, stab, block, and slash. Natoma led the way, demonstrating each move with flawless elegance, and Yarnig did his best to imitate her. He didn’t think he would ever be able to do it as effortlessly as she did. Often, Natoma would correct his technique, patiently offering advice on how to change his sword grip or the way he held his weight. He soon lost himself in the gentle rhythm of the postures. He found there was a certain artistry to swordplay, and he admired the way the blade flowed through the different positions. After spending some time on the exercises, she called a break. She pulled two flasks of water from a pack on the ground and handed one to Yarnig. After their break, they moved on to a more complicated set of exercises designed to increase dexterity and hand strength. Yarnig practiced swinging his sword with three fingers or less and several other odd activities. He fumbled frequently, but Natoma told him he was doing better than most people with his level of experience. He nodded. “Maybe I get it from my mother,” he said, practicing a blocking motion with only three fingers. Natoma gave him a questioning look. “Perhaps you take after her, then,” Natoma said, smiling. Yarnig returned her smile shyly. After another twenty minutes, Natoma called an end to the session, they said their goodbyes, and Yarnig started back for his room in the Clan hall. It would be several days before his next lesson. He had nothing worthwhile to fill that time, but for now, at least, his life did not seem so empty. First, Leha contacted Benefactor. He agreed to summon the others, but he opted not to come himself; he would observe through their eyes. His normal curiosity seemed muted. Her heart ached for what he had suffered through. Part of her felt it had been her fault, but his people had knowingly chosen to join the war and accept the risks. When she returned to the campsite, the others had assembled. Yarnig and Natoma had just come from their sword practice, and sweat bathed their faces. Leha hadn’t yet become accustomed to seeing Yarnig carrying a sword. The hardship of the last few months, as well as the lessons, had added a little bulk to his thin frame, but he still seemed boyish and frail. Everyone had grown thinner and more weather-beaten during the journey over the mountains, but in Natoma’s case, the weathering made her look flushed and healthy, and the loss of weight made her seem fitter. Erik had been training, too, when the call came in, but he had been learning the Clan ways of magic, and the strain on him was not as apparent. Drogin arrived late, looking even more haggard than normal. He mumbled something about how he had been working, and he gave Leha only a tiny nod of greeting. He completed their party. Doga, Eranna, and the master of Yarnig’s guard were in the north, leading the fight against the Automatons, so they could not come. Leha gave a sparse explanation of what she had found, insisting that they had to see it for themselves, and led them into the moist forest, summoning Tyzu’s power to speed their passage. The others were not as agile as her, and they were forced to find a ford to cross the icy river. After a half-hour of jogging, running, and climbing – Yarnig huffed and puffed for the entire trip, but he did not complain – they arrived at the doorway in the mountain. “What is it?” Yarnig asked, peering at the dark opening. “That’s what we’re here to find out,” Leha replied. She led them into the cool darkness. Drogin lit his wand, and Erik did the same to his staff, sending a harsh, green-white light throughout the chamber. The wood and metal gleamed as if newly polished. Drogin muttered something; the others just stared. With greater illumination, Leha could pick out more details of the chamber’s bizarre construction. She could never have imagined something like it. “What is this place?” Erik said. “I have no idea,” Leha said quietly. A hint of a smile touched her lips. She felt she should be nervous, concerned, but she wasn’t. Natoma squatted and ran her fingers over a subtle design of gold inlaid into the floor. Leha crept to the metal globe within the rear wall. She noticed a shallow groove in its upper right quarter. She gently placed the fingers of her right hand into it. Things that may have been letters flashed brilliant sapphire across the globe’s surface. With a whirring and a rumbling, the room came to life. The tangle of machinery that had made up the rear wall flew backwards and disappeared into darkness. Light without source blossomed through the chamber. Leha stepped back, her heart pounding. Behind her, Drogin and Erik raised their magical tools in defensive postures, and Yarnig and Natoma’s swords hissed from their scabbards. Leha’s stomach lurched as the floor descended by two feet. At the same time, the ceiling raised itself higher, and the columns telescoped to maintain their link between the two. Extra stairs unfolded from nowhere to reconnect the now lower chamber to the stairway leading up to the mountain slope. Out in the dark space beyond where the back wall had once been, sections of wood and metal, some of which appeared to have once been part of the wall, emerged from the shadows and began linking together. They found their places and connected into the whole with mind-boggling efficiency, and they had soon formed themselves into a second, larger chamber. The new chamber was roughly square and a few feet lower than the first. Three square sections of interlocking metal and wood plates – Leha thought they might be doors – dotted the walls. Light washed through the new room while two curved segments locked into place to connect the walls and ceilings of the two chambers. A stairway folded out from underneath the floor of the first room to bridge the gap between the two. It seemed as if they had always been so joined. The noise and motion ceased. It had only taken a few seconds. Leha found she could breath again. Benefactor’s presence in her mind had previously been slight, but now she felt his full attention on them. Yarnig lowered his sword. His hands shook slightly. “What did you do?” Drogin demanded. Leha shook her head. “I just touched it,” she said, too distracted to be annoyed with her brother. Natoma sheathed her sword and went to gaze into the new chamber. The others joined her. After a few moments to collect her wits, Leha carefully made her way down the stairs. Natoma and Drogin followed, Drogin moving cautiously, Natoma confidently. Yarnig and Erik brought up the rear. Unlike in the tunnel above, the air here was dry and neither warm nor cool. Erik and Drogin swept their silver rods before them. Drogin shook his head. “What is it?” Natoma asked him. They wandered about the chamber, speaking in hushed tones. Erik and Drogin held out their implements of magic and tasted the place’s energy. Natoma studied the patterns of the floor. She tapped it with her foot, producing a hollow sound that suggested empty space lay beneath it. Leha paced the edges of the room and ran her claws across the walls as if they could whisper their secrets to her. She felt that she stood on the verge of something important. Yarnig stood in the center of the room, taking it all in silently, and Benefactor observed from the edges of their thoughts. Leha came to one of the things she thought to be doors. On the wall next to it, she noticed a small panel of metal a groove identical to the one on the sphere. “Look at this,” she called. The others gathered around her. She pointed to the panel and explained. “Don’t touch it. There’s no telling what this one might do,” Drogin warned, though he sounded uncertain. “The last one wasn’t dangerous,” Erik said, leaning over his shoulder. “Do we want to take the risk?” Yarnig said. Leha nodded once. She touched the panel, and blue lettering flared across it. Everyone moved back a step. The panels of the doorway retracted into the walls, ceiling, and floor to reveal a small, square room of a similar make to the previous two. Within the far wall of the room, behind a dome of faceted glass, stood a small column of blue crystal. They crept inside. Drogin pointed his wand at the crystal, and Erik did the same with his staff. They looked at each other and shook their heads. “What is it?” Leha asked softly. “I don’t know,” Drogin said in the same tone. Leha strode toward the crystal and knelt in front of it. A thin gold framework like an upended tripod held it within its alcove. A faint glow emanated from it. A brass hinge at the top held the glass dome in place. Leha reached to open it. “Leha,” Drogin said, using his most commanding “big brother” voice. She ignored him, and she ignored the sensible voice in her head. She lifted the cover and pulled out the crystal. The room went dark, and the lights in the previous chamber dimmed. Several of the others started, reaching for their weapons. But when nothing else happened, they relaxed. Leha stared into the crystal in her hands. It had a triangular cross-section, and it fluctuated between feeling warm and cool. Its blue glow bathed her face and glinted on her claws. Different shades of blue in various levels of brightness swirled and flickered within its depths, as if it was filled with liquid and someone stirred it. Words from months past appeared in Leha’s mind. They were… nebulous. A cloud of uncertain radiance. Enjoying the story so far? The next chapter will be posted soon, but if you can’t wait, you also have the opportunity buy the full ebook now! This entry was posted in My writing, World Spectrum and tagged books, fantasy, Rage of the Old Gods free chapters, sci-fi, steampunk, The World Spectrum, writing by Tyler F.M. Edwards. Bookmark the permalink.